The inspiration for this project has come from a variety of sources (solar flares, cresting waves, a tunnel of trees, icebergs, rock formations). They all appeared to have one thing in common, namely a similarity of shape. I made drawings and when I commented to my 18 year old son about this commonality his comment was as above. As he also said he felt nature had to include life I have incorporated the dolphins and tree into the design. I had intended to make an abstract design from shapes and made stamps and stencils for printing but it wouldn’t come together so in the end I opted for a more realistic approach. Its construction is based on Gloria Loughman’s linear landscape technique. I have used hand dyed cottons in a complementary colour scheme based around blues and greens. 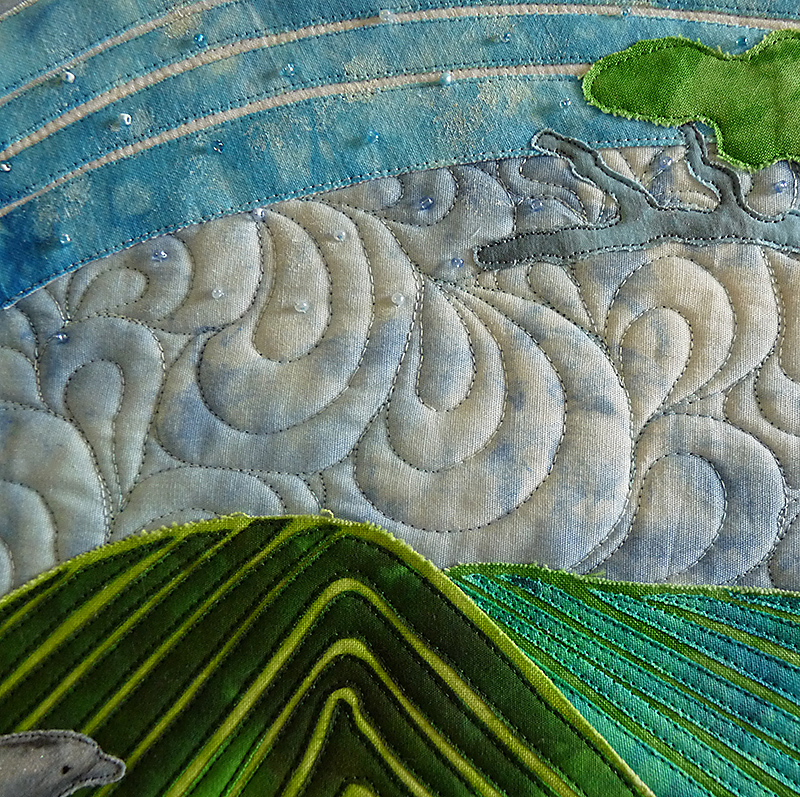 Straight and free motion machine stitching has been used to construct/quilt the piece. 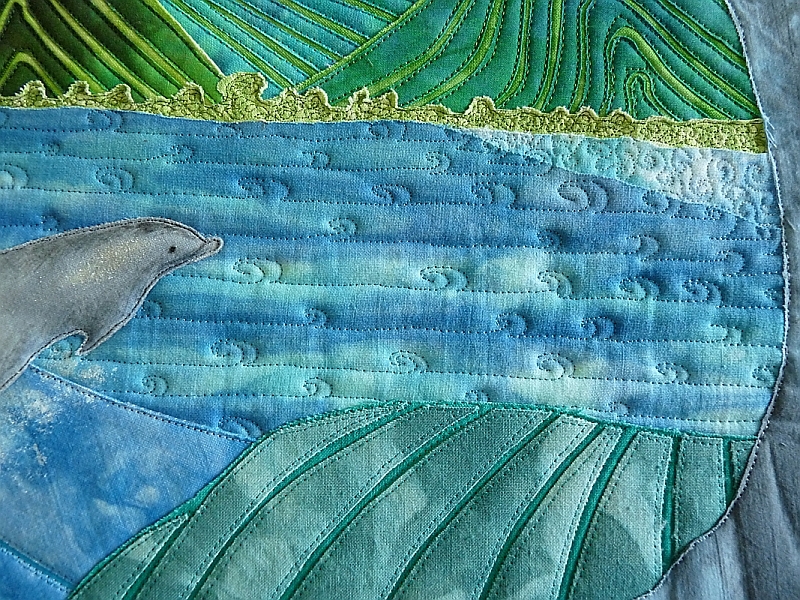 A few glass beads to represent water droplets embellish the wave and some fabric paint enhances the dolphins. It is bound with satin ribbon. I am especially pleased with the way the tree worked out. The fabric was a find from the bottom of my scrap box! Gaye–_The colours and movement are terrific. 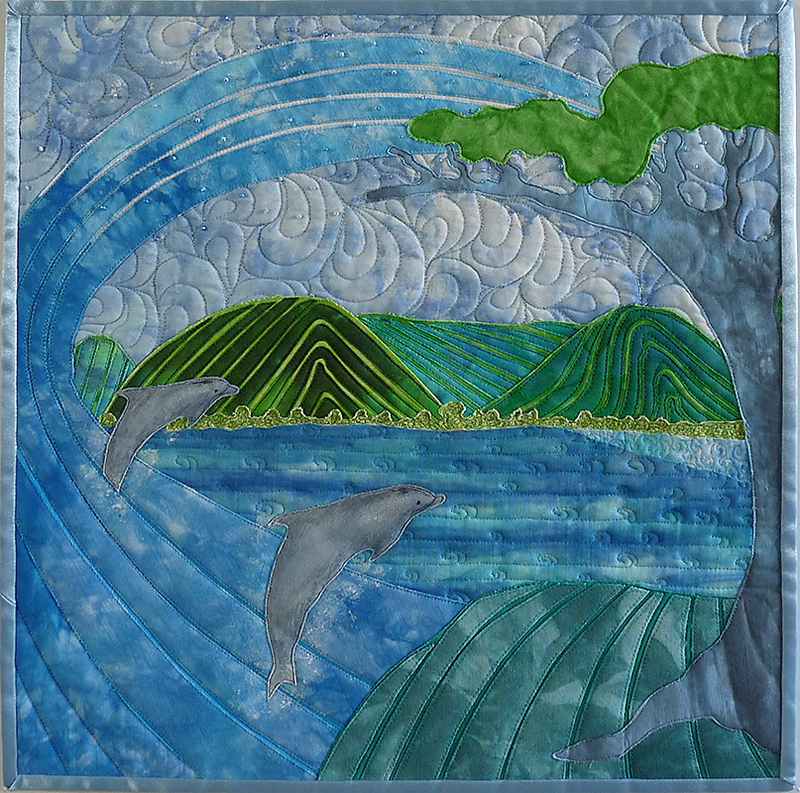 Dear Gaye, this quilt is a credit to your talent, the colours pop and the foreground hills lead the viewer into the nature scene, I do think the addition of the dolphin was good advice. Congratulations.